"I wish you all much success, but I will not be participating. After this past election cycle, I have decided that I am in need of some deserved rest and relaxation from all the political stuff. I have also curtailed my e-mail access. Good Luck!" Sent to me last week by a deeply patriotic friend & FairTax supporter who obviously is worn out & still depressed almost five months after the election. Counting the above note I received a trilogy of messages one recent day including - below "are links to a 2 part series by a Notre Dame Business School professor. Many of his points are spot on. He raises some points you have made on RTE such as the role public education has had in creating the uneducated voter." The professor is a former Democrat. Link #1 – begins with "Many Americans are wondering how their country, a supposed 'center-right' nation, reached the point of electing and reelecting the most radical leftist administration in its history." Covers what readers of this blog know as Citizen Control Points 1 & 2. 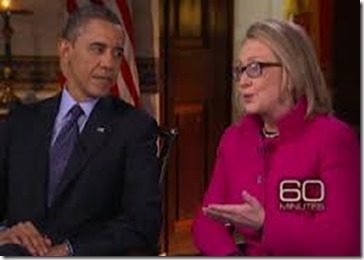 Link #2 – excerpts – "If you are old enough, you can remember Democrats such as Ted Kennedy, in their rare candid moments, rhapsodizing that someday, when they could get 50% of the U.S. population plus one receiving a government check of some kind, they would never again lose a national election! The notorious but true 47% cited by Mitt Romney apparently is close enough....So the Democrats have a vested need to keep the poor down. Our permanent welfare class is no accident. Government incentives for people to stay poor may be well-calculated." Covers Death Of Democracy. The third message in the trilogy included a clip from the first episode of the HBO program The Newsroom that was originally televised on June 25, 2012. The clip was sent by our SC businessman along with the note "The following includes use of some four-letter words that might offend some, but it should be heard by all. We must reverse this trend." This clip & various versions of it have been making their way around the internet. I replaced the version sent to me & present this one without the obscenities. So there is our trilogy – 1) a real life message written by a friend who has worked tirelessly for America until the last defeat by BO took the starch out of him (& many others who have written to me), 2) a two part op-ed series written by an ex-Democrat who accurately defines many of our problems thereby offering solutions, & 3) a dramatization of a TV show that makes many points that need to be addressed. Now we don't know how long it will take the citizenry & particularly people of substance to regather the strength to restore one of God's two great gifts to the world – America; but we do know what it will take to do so – the unleashing of the human spirit in the free enterprise system. But as Mary O'Grady wrote in August 2006 "... what seems to be tempering the hope of even positive thinkers these days is the growing, sobering realization that the burden of socialism is exceedingly hard to throw off, even when patently obvious that it is the chief culprit producing underdevelopment, poverty, & misery." Since large government projects always wind up with the middle class paying for them you can imagine how I feel when far too many people I know naively tell me that they "have nothing to do with politics" – if they understood the above Elmendorf quote they would realize that politicians have plenty to do with them from trying to outlaw the size of drinks they can buy, to not allowing drinking water in public containers on Somerset County golf courses, & now they hear that all this debt & budget mumbo jumbo will affect them. Hard to go bowling tonight & enjoy it with this in the back of your mind isn't it? In addition the Democrat budget proposal specifies no definitive spending cuts but does make it clear that in general Defense spending will be lowered. But the key to understanding the Democrat mindset is that their budget document eliminates the sequester cuts that just about every Democrat would do anything to get away from because it is the only game in Washington that will actually reduce some spending – meager as it is over the next ten years. The result of both the Ryan Republican House budget introduced earlier in the week & the Murray budget is that spending will increase meaning that government will continue to grow & the government dependent mindset will not even start to be changed let alone reversed. The sequester is the only mechanism going that gives us a chance @ a needed mindset change. Now just what are our elected reps supposed to be doing regarding all of this - Article I of the U.S. Constitution grants Congress the power to raise money for the Treasury, to pay the country's obligations enumerated in the Constitution, & from time to time to publish statements of all financial transactions. Specifically the Congressional Budget Act of 1974 (CBA) requires Congress & the President to write a budget each year. BO's proposal for Congress's consideration was due on February 4 & is now projected to be delivered the week of April 8. Congress is directed by the CBA to draft its own proposal & both Chambers are required to agree to a budget resolution by April 15 so that the country has one expression of our governing philosophy. Now of course it is hard for anyone to remember when anything of this sort happened. I have to go back to the time after the Revolutionary War when our debt was 40% of the young economy. Hamilton & Madison, who detested each other, worked for the good of the country & not their personal political agendas to solve this problem to effectively liquidate this debt. How far we haven't come. Both the Ryan & Murray budgets are frauds & not just because they make different assumptions over the ten years they each project revenues & spending for but because they both don't address the financial problems we have & yet pretend to do so. Murray's budget is not worth discussing because it provides few details – it is not even a shadow of what is required because it leaves the spending trajectory right where it would be if Murray did nothing – @ $46,000 billion over the next ten years. Ryan claims to lower this trajectory to $41,600 billion but it is so filled with contradictions & political impossibilities that are absurd. For instance, Ryan defunds ObamaCare (40% of his total spending reductions) – see all the zeros in Table S-3 below from Ryan's budget plan. Next Ryan shows a spending reduction of $1,837 billion – see Table S-4 below. This total defunding will never become law in the next four years meaning that Ryan would have to reduce spending by another $1,837 billion to really balance the budget as he claims his budget does if the rest of it was real – which it is not. In addition, following the goal of preparing a balanced budget Ryan keeps $716 billion of make-believe Medicare cuts in payments to doctors, hospitals, & drug companies (like he wanted to do in the campaign before Mitt overruled him) that are part of ObamaCare as well as other tax increases that are part of the law. Congress always goes for the "docs fix" @ the last minute so the Medicare cuts won't happen either. Ryan also keeps the $600 billion that made up the fiscal cliff tax deal on New Year's night. At least Ryan does not eliminate the sequester cuts like Murray does. Another part of this current disingenuous Republican House financial story is that when they recently voted to extend the Continuing Resolution (CR) that funds many government agencies they did not touch the administrative parts of ObamaCare that they really could have defunded. Very sad indeed how they play us for fools – but then again it is only because we let them & actually encourage them. In summary there is not enough difference between Ryan's & Murray's budget plans for either of them to help us. Some of the savings they both are finding are figuratively tantamount to things like calling a spending cut money left over from the 2010 census or finding money in a drawer that was not spent on the Spanish-American war. Republicans will make a big mistake if they enter into a grand bargain deficit reduction deal with BO because it will result in no change or business as usual including letting BO off the one hook he has fastened onto – namely the sequester, which remains our best chance of effecting a national mindset change. By now you would think Republicans would know they can't negotiate with BO because his agenda is not one of helping America but rather transforming America to a one party socialist nation for starters. To help our country 1) the entitlement mindset has to be changed & 2) the entitlement cost curves have to be bent down. Both of these goals can be accomplished by implementing a premium support plan not indexed for inflation for Medicare & by changing the determination of the initial benefit to one based on the CPI instead of the average real wage index for Social Security. Absent the above entitlement fixes, implementation of Ken Blackwell's Cut, Cap, & Balance plan, & enactment of the FairTax the effects shown on the above graph will soon be felt if they aren't already – i.e., the entitlements & interest on the national debt will crowd out all other government programs like Defense as year after year the red bar keeps getting closer & closer to the horizontal dotted line. As this continues the citizenry in our apathetic society who think they have nothing to do with politics will one by one become familiar with the meaning of the terms default, insolvent, bankrupt, & defunct. The above quote from Senator Durbin paraphrases a portion of FairTax presentations I make @ Tea Party rallies re the inhumane way our elected reps are letting Social Security & Medicare cruise to higher altitudes on automatic pilot before these programs run out of gas – "So what's not for seniors to like – except that these programs are not financially sustainable? How unkind is it for our elected reps to let this continue until total collapse of the programs? It is the elderly & people over 55 who are dependent on these programs who will be hurt the most when the programs collapse. Just what will these people do then?" Sequester cuts of federal government spending began on March 1 – a total of $85 billion of cuts in FY 2013 that ends on September 30 will be made as a first installment of the ten year sequester program. Over the past week it has become very obvious that there are different priorities regarding how to make these cuts. Please contrast the following two approaches concerning implementing the sequester with regard to the best interest of the country: 1) On February 26 Oklahoma Senator Tom Coburn wrote a letter to the White House Office Of Management & Budget detailing 1,362 programs accounting for $364.5 billion in federal spending every year that could consolidate duplicative, overlapping, & nearly identical jobs; & 2) BO canceled visitor tours of the White House during Spring break – he forgot that the tours are conducted by unpaid volunteers & that Eric Bolling & Sean Hannity have each offered to pay for whatever costs are incurred for a week of tours out of their own pockets. The salutation of Senator Coburn's letter illustrates just how disinterested BO is in economic budget matters – the letter was addressed to the current Deputy Director of OMB because there has not been a Senate-confirmed Director of OMB for over thirteen months. Click here to read Senator Coburn's letter & be sure to scroll down to the bottom to see the list of programs just to get an idea of the nonsensical waste we the taxpayers foot the bill for each year. BO's infantile games like canceling White House tours will continue until enough people see through his approach to make the sequester cuts as obnoxious, inconvenient, & hurtful as possible. All of BO's overstating of the sequester's severity & now backpedaling on this may be putting a crack in BO's armor with some people – his approval rating has fallen below 50% with Reuters showing him @ 43%. The sequester remains our best chance to force some degree of financial responsibility on our elected reps. This first round of $85 billion of across the board federal spending cuts in FY 2013 will be followed by a second round of $110 billion in cuts in FY 2014, & so on until the originally agreed upon $1,200 billion in cuts have been made. Unfortunately while the sequester cuts are being made federal spending will increase by $7,000 billion in the next ten years so there is no real absolute spending reduction @ all. Now no one can relate to the unfathomable magnitude of these numbers, but as dangerous as they sound they are still just a small part of the overall problem. There are tens of trillions of dollars of unfunded Medicare & Social Security liabilities that never appear on the government's balance sheet – these are the realities of entitlements that Senator Durbin says the Congress is derelict in addressing – & he is so right. The trillions of dollars involved is so large that it can only be paid off by the government purposely debasing the currency meaning it will take a wheelbarrow full of near worthless dollars to buy a loaf of bread or a postage stamp. This will be reminiscent of 1775 when the paper money issued by the Continental Congress became "not worth a continental" – in fifteen years that paper currency lost 99% of its face value thereby prompting the gold & silver clause of the U.S. Constitution. But the implementation of the sequester, small as it is, can possibly effect an all important change in mindset for our elected reps as well as the citizenry. Let's get our elected reps thinking about & actually performing some budget restraint even @ this lowly sequester level. We must work up to the position Senator Durbin enunciated above regarding entitlements – the current entitlement liabilities (over the next ten years) along with interest on the national debt represents about 60% of federal spending – the sequester cuts are limited to programs in the other 40%. 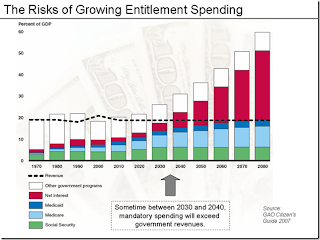 The tens of trillions of dollars of unfunded entitlement liabilities are over & above these amounts. 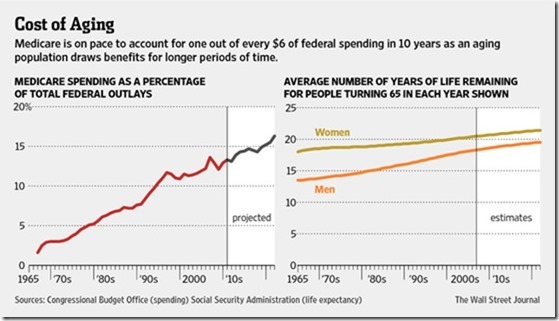 The above graph shows the problem with an aging America. Read it carefully. Trying to actually make the sequester work by following the lead of Senator Coburn to effect meaningful cuts that will begin to reduce the size of government & its claims on earned income is the bedrock start that is needed. In this sense the sequester is the spark or catalyst needed to change the American mindset. This limiting of government may take hold & instead of small sequester cuts we could eliminate, off the top of my head, the Departments of Health & Human Services, Education, Commerce, Agriculture, Transportation, HUD, the EPA, the National Endowment of the Arts, & the National Endowment of Humanities. But even the elimination of all of these departments will not solve our gargantuan entitlement problem. As RTE has pointed out several times the Medicare problem can be solved by going to a premium support system, preferably not indexed for inflation, & the Social Security problem can be solved by changing the determination of the initial benefit to one based on the CPI instead of the average real wage index. See Four Points Highlight The Needed Change In Mindset for complete details. Please note how even the timid Ryan price indexing curve shown on this posting (bottom curve) bends down over time making premium support an extremely humane transfer away from the current Medicare system while returning to America's youth so much of the liberty that has been lost. And there is one other thing we could do right away – like in the next five minutes. Replace the progressive income tax system with the FairTax.